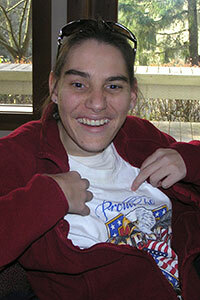 Kendyl is one of the newest members of L’Arche Tahoma Hope (Tacoma, WA). She moved into Farmhouse on June 12, 2013 from her parents home. Kendyl is 27 years old. Kendyl has brought a lot of energy and excitement into our community. Her attitude is one of curiosity and joy. She has been a patience teacher of sign language. She enjoys prayer, attending church, welcoming visitors and weekly bowling and swimming outings. Kendyl is excited for her new job assisting at a preschool.